Sato Sakura Gallery welcomes you to participate in our introductory Nihonga workshop. Come learn about the history and significance of Nihonga paintings in this hands-on workshop that will familiarize you with the materials used within Nihonga paintings such as mineral pigments, paper, gelatin, and more. You will discover how to combine these materials and create your very own Nihonga piece to bring home. Sato Sakura is proud to offer the Nihonga Starter Kit, now available online and in the gallery. The Nihonga Kit provides step by step instructions (English and Japanese) for creating beautiful Nihonga paintings featuring sakura, iris, and japanese camellia. Everything you need to start painting is included inside. Ronin Gallery and Sato Sakura Gallery will come together this November to transcend time and medium in the collaborative exhibition Sakura: An Enduring Tradition. Ronin Gallery will present a collection of 18th – 19th century Japanese woodblock prints that depict cherry blossoms, while Sato Sakura will evoke the blooms of our contemporary world through contemporary Nihonga paintings. With each gallery a leader in their respective field, this exhibition provides a rare opportunity to explore such important works side-by-side. Although rooted within different periods and social classes, both ukiyo-e and Nihonga are distinguished by their lasting impact on the history of Japanese art. Ukiyo-e, or “images of the floating world,” captured the vital, urban culture of Edo that first blossomed in the 17th century. Embraced as the medium of a newly emerged middle class, these woodblock prints embraced the humor, excitement, and beauty of popular culture and everyday life. From Hiroshige’s romance with the Japanese landscape, to Kuniyoshi’s mastery of the fantastic, ukiyo-e artists created a dynamic art form that inspired not only their contemporaries, but also the Impressionists, Post-impressionists, as well as artists today. As Western-style painting gained popularity in Japan during the Meiji period (1868-1912), Nihonga, or “Japanese-style painting,” fused the familiar materials and traditional techniques of Japan’s revered painting schools with artistic ideas from the West to create a distinctly modern approach to painting. Today, Nihonga artists continue to capture contemporary life in mineral pigments and gold leaf, ever adapting this dynamic medium. Through Sakura: An Enduring Tradition, Sato Sakura Gallery and Ronin Gallery invite you to immerse yourself in this selection of works that celebrate past, present, and continuity through the theme of the cherry blossom. The Ronin Gallery is a leading family-owned Japanese and East Asian art gallery in New York City and home to the largest private collection of 17th–21st century Japanese prints for sale in the United States. Founded in 1975 in the Explorers Club Mansion of New York City, the gallery is now located on Madison Avenue and 49th Street. For more information about the gallery and to access the gallery’s online exhibits, visit: www.RoninGallery.com. Nihonga Workshop is coming back! Learn about the history and significance nihonga paintings possess. This hands-on event will familiarize you with the materials used within Nihonga paintings, such as mineral pigments, paper, gelatin, and more. You will discover how to combine these materials and create your very own Nihonga piece to bring home. New York-based Nihonga artists, Takashi Harada and Kae Sato will be leading this workshop. Sato Sakura Gallery New York is pleased to announce the opening of “Sakura- Japan" from Thursday, July 12 to Oct. 27th. Featuring a large-scale painting on four panels by Nobuyoshi Watanabe, the exhibition introduces the variety of scenes with cherry blossoms. The exhibiting artists are Nobuyoshi Watanabe, Jun'ichi Hayashi, Reiji Hiramatsu, Shin Sato, Hiroshi Sugimoto, Yoshitaka Kuroiwa, Naoki Kadoshima, Noriko Okawara, Masaharu Fujishiro, Takashi Nagoya, Kaori Someya, Hiroki Takahashi, Emi Miyako and Mariko Yoshida. We are closed for the installation and will be reopened On July 12th! Join us for this unique opportunity to hear an Artist Talk by one of the most celebrated Nihonga artists, Chinami Nakajima. Chinami Nakajima was born in Obuse in Nagano Prefecture. He is the third son of Kiyoshi Nakajima, who was also a Nihonga painter. During Nakajima's student years, he aimed to create a new style of Nihonga, breaking free from the existing traditional Nihonga style. His doubt and anger about the society later inspired him to create the series, "Portrait". This became his life work. His subject matter is vast, however, he is well known for his depictions of fresh flowers, such as cherry blossoms and peonies. His motto, "more real than real," is evident in his painted flowers, blooming proudly alive in the frame. In recent years, he completed curtains installed at the Shin Kabuki-Za Theater with the theme "Spring and Autumn." He also created paintings on sliding screen doors in Sakura room at Koyasan Kongōbu-ji. He was a professor at Tokyo National University of Fine Arts for 19 years and is currently a professor emeritus at the university. Enjoy his unique perspective on the art of Nihonga, and view one of his masterpieces, a four-panel folding screen, titled “Spring Night, a Weeping Cherry Tree in Miharu” exhibited at Sato Sakura Gallery. Space is limited and RSVP is recommended. New York-based Nihonga artists, Takashi Harada, and Kae Sato will be leading this workshop. Hanami, or "Flower viewing" is a popular spring pastime in Japan. In celebration of this coming Spring in New York and the gallery's Ryo Date exhibition, Sato Sakura Gallery presents Sounds of Sakura, a Japanese Flower Arrangement and Live Performance with koto (Japanese zither). Both performances are cherry blossom themed, resonating with each other. Flower arrangement by Eriko Nagata and koto performance by Jun Ando. Please enjoy the season of Cherry Blossoms that pass by quickly. We are pleased to present this exhibition featuring the work of Nihonga artist Ryo Date, renowned for her emotionally moving renderings of the mountains, sea, and countryside of Japan’s landscape. Ryo Date was born in 1962 in the Shouzu district of Kagawa prefecture. After completing her graduate studies at Tokyo University of the Arts in 1987, she exhibited her work in numerous solo, group, and juried exhibitions. In 1989, as part of the restoration of Nara prefecture’s Yakushiji temple, a UNESCO World Heritage Site, she was responsible for reviving the color of two Deva King figures. Her work at the 1993 group exhibition Yuga no Kai was acquired by the Ministry of Justice. Known for her landscape paintings, Date depicts a range of subjects including her hometown, villages or towns for which she has a close affinity, plants that color the four seasons, animals, and more. Each of her works is rendered with a sense of nostalgia and intimacy, bringing a tranquility to the heart of the viewer. She is especially recognized for her sensibility with water and light. In recent years, she has broadened her vision beyond Japan, creating landscapes that portray the sakura trees of Washington D.C. We can continue to look forward to her work as an artist in the years to come. In this exhibition, we have included Ryo Date’s contemporary Nihonga landscape paintings in combination with a selection of pieces from the Sato Sakura Museum’s collection. In the midst of New York’s sakura season, please enjoy the beauty of contemporary Nihonga. March 30th and 30th. Both dates from 2-4p.m. Learn about the history and significance nihonga paintings posses. This hands on event will familiarize you with the materials used within Nihonga paintings, such as mineral pigments, Paper, gelatin, and more. You will discover how to combine these materials and create your very own Nihonga piece to bring home. New York based Nihonga artist, Takashi Harada and Kae Sato will be leading this workshop. * Please be prompt for your workshop as instructors will start on time. Participants are given 10 minutes leeway regarding the arrival. After 10 minutes (sharp) , participants will not be permitted to attend the class. * The workshop fee includes materials cost. * Space is limited to 10 students and advance registration is required. * For age 12 and older. * Non-refundable due to the material preparation. This hands on event will familiarize you with the materials used within Nihonga paintings, such as mineral pigments, washi (Japanese) paper, gelatin, and more. You will discover how to combine these materials and create your very own Nihonga piece to bring home. New York based Nihonga artists,Takashi Harada and Kae Sato will be leading this workshop. The sakura’s beauty lies not only in the splendor of its full bloom, but also in the transience of the blossoms, which, once each year, emerge in splendor only to wilt away in an instant — a beauty which countless artists have used metaphorically to capture the human experience of life and death. Even today, Nihonga artists enamored with the sakura seek to nd new and unique expressions as they create their work, building upon countless artworks portraying the sakura from generations before them. Sato Sakura Gallery New York is pleased to announce the opening of “Landscape”. Featuring a large-scale painting on folding screen by Koji Mizutani, the exhibition introduces the variety of scenes with cherry blossoms. The exhibiting artists are Nobuyoshi Watanabe, Yoshitaka Kuroiwa, Naoki Kadoshima, Emi Miyako, Noriko Okawara, Kazuyuki Suto, Masaharu Fujishiro, Junji Kondo and Mariko Yoshida. The opening reception will be held on Friday, November 3rd, 2017. The Sato Sakura Museum of Art is pleased to announce the launch of our new branch in New York. The Sato Sakura Museum of Art opened its Koriyama museum in the city of Koriyama, Fukushima Prefecture in October 2006, and its Tokyo museum in Meguro, Tokyo in March 2012, as specialist art museums offering the opportunity to view contemporary Nihonga. In August 2017, we made a year of even greater progress by opening a gallery in New York, USA, as a space where even more people can enjoy contemporary Nihonga. Henceforth, through our activities in Tokyo and New York, we provide people from around the world with the opportunity to experience and be inspired by the wonder and diversity of contemporary Nihonga. 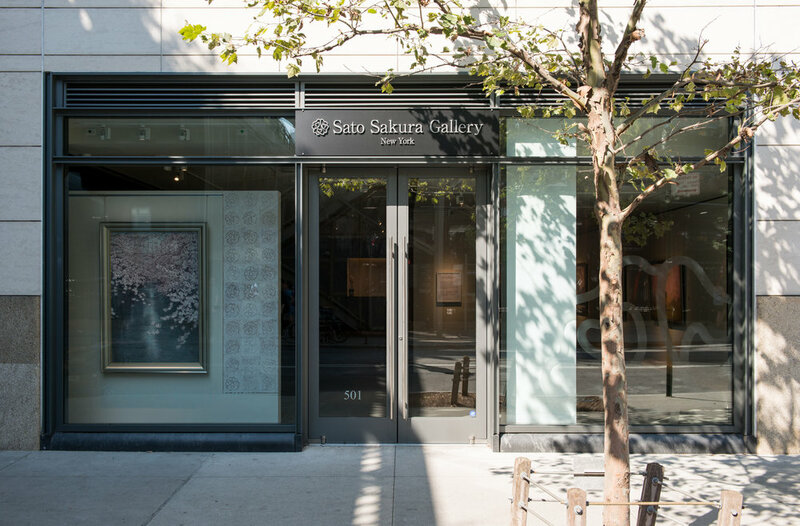 The Sato Sakura Museum of Art is pleased to announce the launch of our new branch in New York. The Sato Sakura Museum of Art opened its Koriyama museum in the city of Koriyama, Fukushima Prefecture in October 2006, and its Tokyo museum in Meguro, Tokyo in March 2012, as specialist art museums offering the opportunity to view contemporary Nihonga. In August 2017, we are marking a year of even greater progress by opening a gallery in New York, USA, as a space where even more people can enjoy contemporary Nihonga. Henceforth, through our activities in Tokyo and New York, we hope to provide people from around the world with the opportunity to experience and be inspired by the wonder and diversity of contemporary Nihonga. It is an honour for us to have a privilege to invite you at SAKURA opening reception.